Many people think that the two terms Act and Law have similar meanings and are interchangeable. However, there is a difference between the two in legal terminology. In simple terms, law is a system of rules that tells people how to govern their behavior in different situations and these systems are enforced by the responsible social institutions. An Act, on the other hand, is a form of legislation passed in the parliament in order to make or change a law. This can be considered as the main difference between act and law. Let us look at the terms in detail. 1. What is an Act? 2. What is a Law? 3. 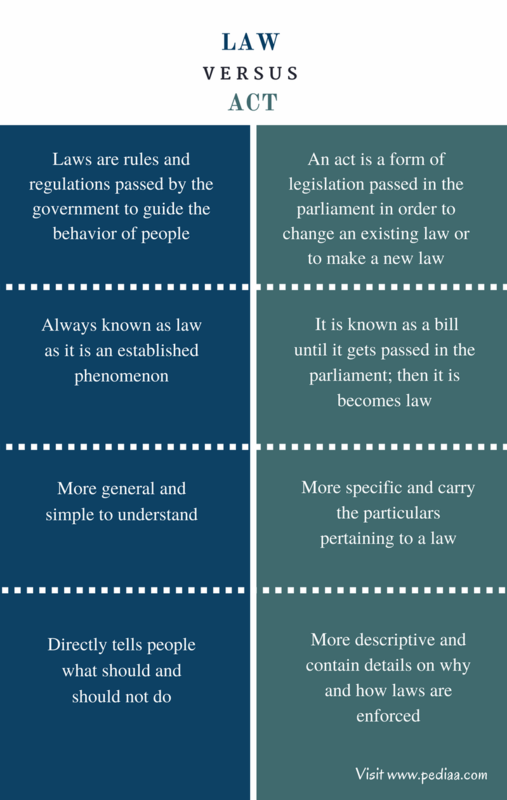 What is the difference between Act and Law? Law is a system of rules enforced through a social institution mainly to govern the behavior or the conduct of people in a particular society. Usually, laws are made in a parliament or a legislature as a collective idea; it could also be a result of a single legislator’s decision. There are so many laws referring to different situations and common people are usually aware of these laws and try to adhere to them as possible. Laws are always easy to understand. They are passed to the general public in simple language. For example, driving a vehicle without a valid driving license is against the law. Thus, people know that they should have a proper license with them while driving. Furthermore, laws help to maintain social order and they always guide and protect people. If a person is ill-treated, he/she can seek justice in a law court. If an individual goes against a particular law, he/she can be punished accordingly. A law is always followed by a penalty. Laws exist in almost all the societies and they are made by an authorized set of people chosen by the general public, usually the members of the parliament. Moreover, different societies practice a different set of laws based on their specific norm systems, which may also change over the time. 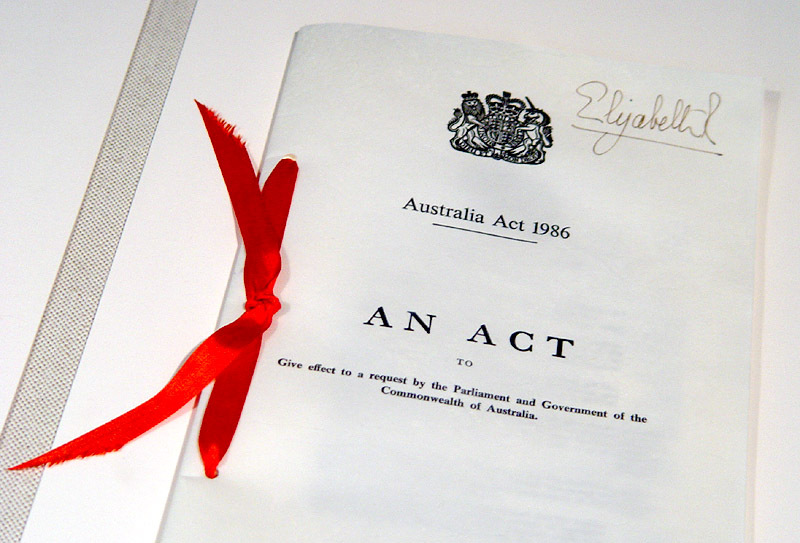 An act is a piece of legislation passed in the parliament in order to change an existing law or to make a new law. An act is more specific and more detailed than a law. Usually, an act is a constitutional plan which is created by the government. It is normally created in the parliament. The ministers of the parliament have to vote for the act in order for it to become a law. Until an act gets passed by the parliament to become a law, it is known as a bill. An act may be applied to a particular group or a particular part of the society only and that is why it becomes more specific. An act makes people aware of the requirements relevant to a particular situation and describes why and how people should adhere to a certain law. An act, once passed with higher assent by the members of the parliament, can be changed only by passing another act. Once an act is annulled, its provisions are not applied. The parliament of a country has the responsibility to make and implement acts as needed. Thus, the ideas of the government come to the public through acts, making them compulsory to follow. Law: Laws are rules and regulations passed by the government to guide the behavior of people. Act: An act is a form of legislation passed in the parliament in order to change an existing law or to make a new law. 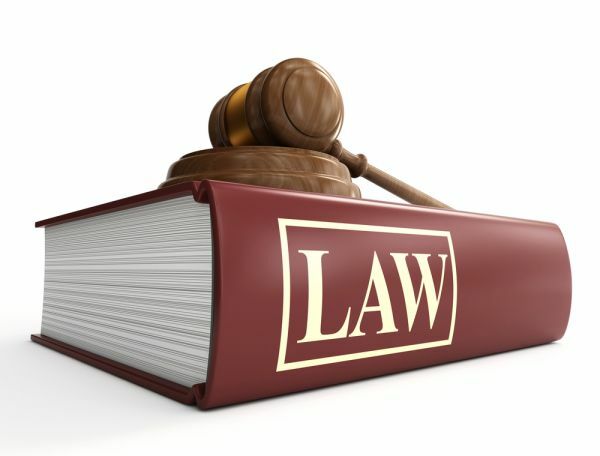 Law: Law is always known as law as it is an established phenomenon. Act: Until the act gets passed in the parliament, it is known as a bill. Once passed, it may become a law. Law: Laws are more general and simple to understand. Act: Acts are more specific and carry the particulars pertaining to a law; they reflect the ideas of the government in a particular society. Law: To understand common rules and regulations we always refer to laws. Act: To know about more details referring to some laws, we need to study relevant acts. Law: Law directly tells people what should and should not do. Act: Acts are more descriptive and contain details on why and how laws are enforced. These are more important in law courts to get a complete set of information which enables lawyers to talk in favor of one side.